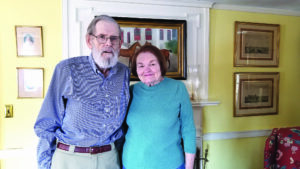 Being held up on the runway for nearly three hours because of inclement weather would make for a bad day for most, but for Nicholas and Mary Frances Silitch, it was the making of a love story. The two, at the time, were strangers caught on a delayed flight from Newark to Washington, D.C., just before Thanksgiving. “I was seated between two women and the plane was empty, so I got up and moved to the next seat,” said Mary Frances, who was on the way to Virginia to see her sister. Nicholas was sitting by the window in her new row, on the way to Virginia to visit his mother. “He is always very well-dressed,” Mary Frances blushed. After Thanksgiving, the two just happened to end up on the same return flight. They shared a taxi after the flight and found they lived on the same street, 65th Street, in New York City. Mary Frances was the associate editor of Flying Magazine and Nicholas was a stock broker. They started dating immediately upon returning and married about a year later. “We went out almost every night after that,” said Mary Frances. The now-North Granville couple will celebrate their 49th wedding anniversary next Thursday, Feb. 15.